Isn’t it absolutely amazing how we as humans are never fully satisfied? I know, it sounds like the craziest thing coming from me but hear me out. We never stop yearning to go on new adventures and gain new knowledge. We strive to grow and meet new places within ourselves, others and this world. Following that drive, moving forward and trusting weird nudges of direction is the one thing that makes this life so grand, that pushes us to expand and the one thing that makes this planet grow. So go be unsatisfied and see where it may lead you! While on the subject of constantly moving forward and experiencing. As if having a baby isn’t enough (phew!) and wondering where the *piiip* to live/buy/build a house (this one is a short term rental), Me and Fabian (and Caspian) have finally decided to head out into the world together. Or more like, we’ve finally decided on where to start :) Mid September we’re off to hug redwood trees, visit sunny farmers markets, dip our toes in the pacific ocean and walk up and down the hills of San Fransisco. Yup, California here we come! After that we’ll touch base in Sweden for a while before heading to mama Bali. For how long we’re staying at each place we haven’t yet decided, it all comes down to how much money we’ll be able to put aside for it. Because Fabian is the down to earth realist of us he thinks 5-6 weeks is perfect and because I’m the miracle realist of us I think ”indefinite” sounds pretty awesome for both destinations. We’ve both been to Bali (and are very excited to return) but neither me nor Fabian have ever been to the states. The wanderlust is dancing in our souls but what I think we’re most psyched about is having free time together as a family. Time for infinite hugs, adventure, food, growth and many, many meetings with the world and what it holds. Did I mention food? No? I’m so excited to eat ;) Anyways, I have a huge favor to ask, would you give us your best foodie tips, favorite spots, perfect Air bnb’s, inspiring cities/villages/neighborhoods, markets, restaurants and… well anything and everything your gorgeous brain and heart can think of! What else?..The first Swedish strawberries. 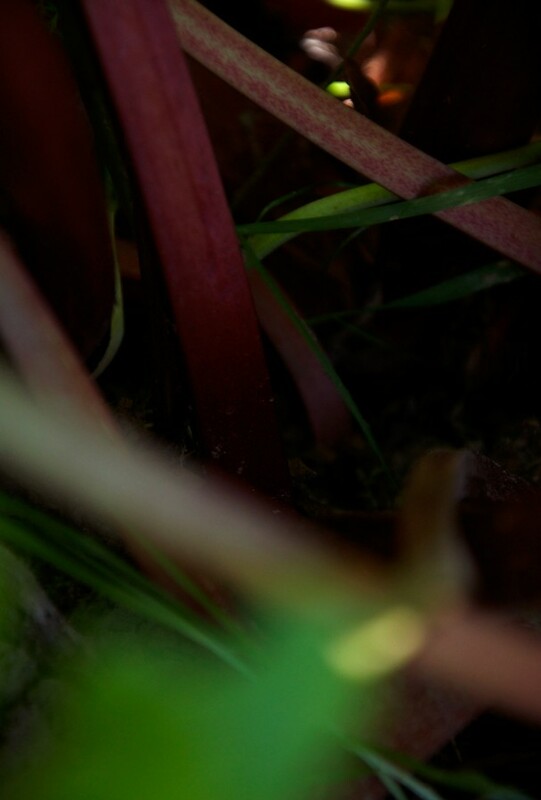 Rhubarb from the garden. Caspian crawling naked in the grass (in the funniest way on only hands and feet!). Me barefoot all the time (so not that much difference from other seasons..). Wanting to spend every evening on the balcony bathing in warm rays of late sunshine. Guys, summer is here, as is the season of popsicles and these, my friends are particularly yummy. I typed in ’Chia seeds’ in the search bar here on Earthsprout and found a bunch of great recipes but not one Fun & Fabulous Facts-section was focused on the sensational super seed. So is it time or what?! Chances are high you’ve already met the chia seed dressed up as fake egg in baking directions or on top of a smoothie at a cool juice bar or you’re a full blown chia addict with a huge jar in your kitchen. What do I know? My question is, have you ever fully appreciated those tiny dinosaur egg-looking friends fully? You can soak them to make yourself a simple or fancy lady chia pudding (there are a few fun + tasty recipes in my app! ), add to a glass of water and a squeeze of lemon and you’ve made a chia fresca. As mentioned eariler, use it baking, pancake making, as breakfast/smoothie topping. If nothing else, chia seeds are perfect for making nutritious and fun childrens food & treats. Caspian loves em’. Also, you can make a totally yummy jam using chia seeds since they tun into a thick gel when paired with liquid. So if you’ve cleaned up your diet but miss that spreadable, gooey texture that regular sugary (and a bunch of other additives) jam has then chia jam so is your new jam! There are many good reasons to start incorporating this legendary seed into your daily meals. Native americans considered chia seeds to be the perfect endurance food for runners and warriors and now we know that it is in fact one of the top sources of Omega-3 fatty acids (hello superhero endurance and wellbeing). Chia seeds also pack a whole lot of iron, fantastic soluble fiber, complete protein (all essential amino acids!) and calcium. Want arguments for the non-believers? 1 tbsp of chia seeds actually contains more calcium then one glass of (dairy) milk, has more Omega 3’s then salmon, 3 times more iron then spinach, 2 times more potassium then bananas and more antioxidants then blueberries. But what does that mean? Well, how do you feel about feeling full, calm, strong and filled with energy? Because that’s what a balanced blood sugar, full belly, met mineral needs, a good protein load, intestinal health and a hydrated body will do to ya. Make sure you soak your seeds before eating as chia absorb 7-9 it’s weight in water which means that if you don’t pre-soak they will pull water from your body making you dehydrated and leaving your body stressed instead of elevated. Summertime means simple recipes. 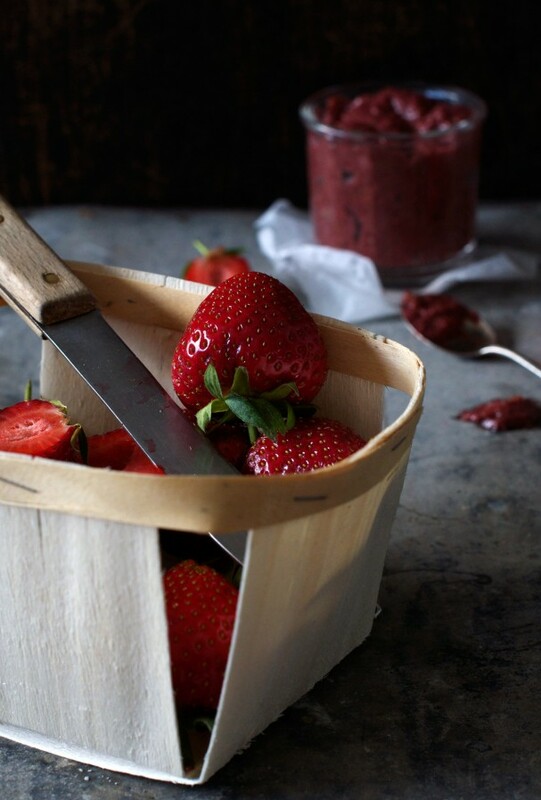 The chia jam (wich is also perfect as spread, on top of your breakfast porridge or in desserts) is a breeze to make then all you have to do is grab your favorite yoghurt, sweeten it and layer them both into popsicle moulds, pop in a few fresh berries, freeze for at least 5 hours and enjoy them in the sun. 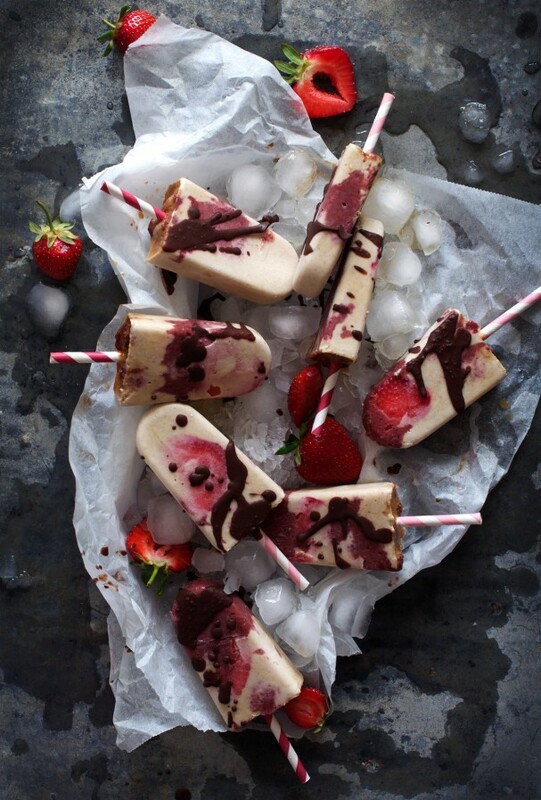 The raw chocolate drizzle is optional but not at all time consuming to make and oh so delicious. Go play! 1. 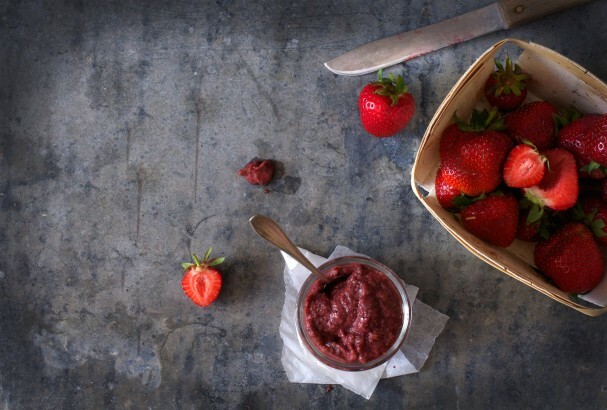 Add strawberries to a blender and blend to a strawberry sauce. 2. Rinse, peel and slice rhubarb and add to a medium saucepan along with strawberry sauce, lemon juice + zest, vanilla, cloves and rice malt syrup. 3. Bring to a boil, covered. Then let cook on low heat without lid until liquid is reduced to approximately half. This takes around 10-15 minutes. 4. Grind chia seeds in a coffee grinder or high speed blender. Add chia meal to the saucepan, stir until thoroughly combined. Refrigerate. 1. Add yoghurt, vanilla and bananas to a blender and blend until smooth. 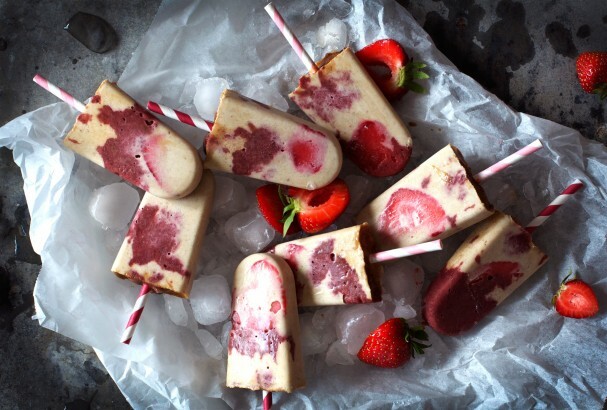 In 8 popsicle molds layer 1 cup Rhubarb Strawberry Chia Jam with the Yoghurt and two or so slices fresh strawberry. Freeze. Drizzle with raw chocolate (below). Enjoy in the sun! 1. Melt cacao butter carefully on the stove in a water bath. Add all other ingredients to the bowl and stir until incorporated and smooth. 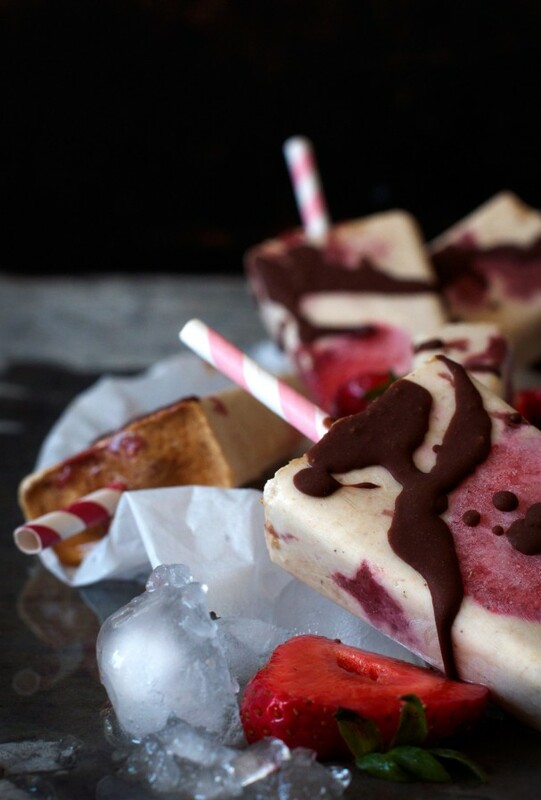 Drizzle over the frozen popsicles. Summer here we come! California & Bali (and prolonged summer) here we come! Scary, fun, big, delicious! Where will your drive, your unsatisfied soul take you today? Where will your undeniable urge to grow lead you?